Paralympic Gold Medal Stamps - first details from Royal Mail..
Royal Mail have provided some preliminary details of the Paralympic Gold Medal stamps. Designs are not yet available but will be launched on 29 August. "Each miniature sheet will comprise of two identical 1st Class stamps featuring the UK Gold Paralympic Medal winning athlete or team. The stamps will use the same design format that was created for the Olympic Gold Medal Winner stamps issued after the Team GB medal winning events during the London Olympic Games, only with the Paralympic logo substituted for the Olympic logo. Each stamp will bear the athlete/team’s name and the name of the event. The format was created by Manchester based design consultancy True North. "The medal winner’s image will be dropped into the format and the artwork sent to the printers with the objective of having the Gold Medal Winners Miniature sheets on sale at the 518 Post Offices that received the overnight distribution of the Olympic Gold Medal Winners stamps as soon as possible with a wider distribution to a network of 4700 offices later. A4 sheets from each of the 6 regional printers will be available to order from Tallents House. 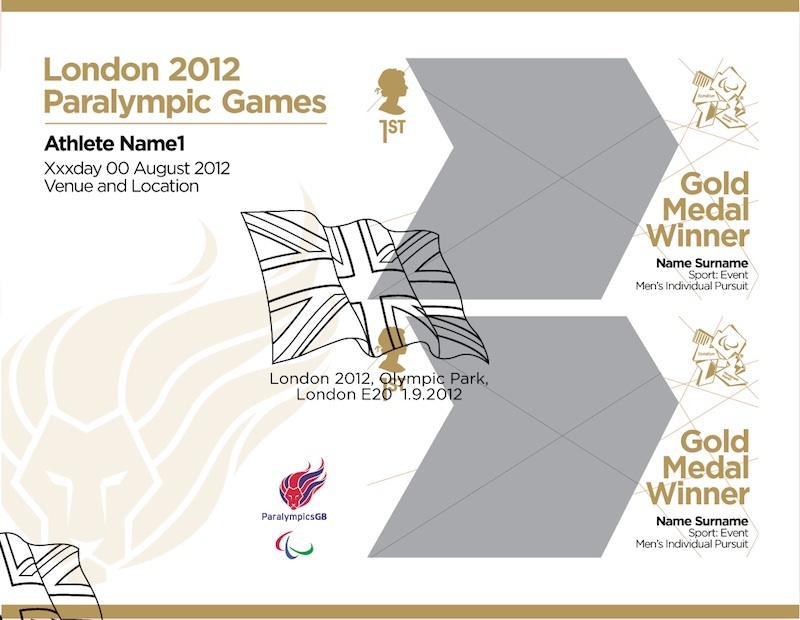 Each A4 sheet will feature 8 minisheets; 2 each of 4 Gold Medal Winners. Price £9.60." The FDC and postmark designs will be very similar to those for the Olympic. Royal Mail are in discussions with the British Paralympic Association and LOCOG about all the products. More details next week. Q: What discount may I receive on ParalympicsGB Gold Medal stamps? A: We will shortly write to our customers and this will give details of the offers. Q: Will A4 printers sheets be available for the ParalympicsGB Gold Medal Winners stamps like they were for the Olympic Winners? A: Yes, the A4 sheets will be available direct from Royal Mail Tallents House after the end of the games. 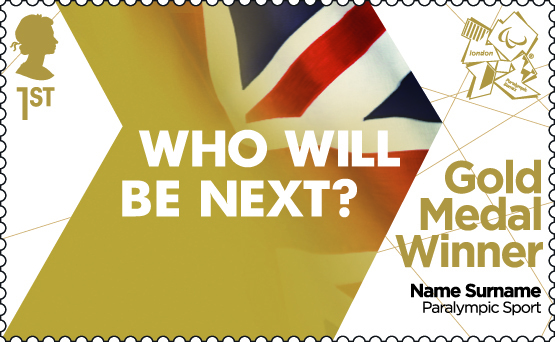 Q: When are the ParalympicsGB Gold Medal stamps issued? Q: Which Post Offices will sell the stamps? A: The Post Offices that sold the Olympic Gold Medal Winners stamps will be receiving the ParalympicsGB Gold Medal stamps. Q: Will Post Offices open on a Sunday to sell these stamps? A: As there will be no stamp issue dates on a Sunday, the Post Offices will not open that day. Q: Will there be an album produced to house the stamps? A: Yes, there will be an album designed specifically for both Olympic and Paralympic Gold Medal Winner stamps and we will have this available in approximately four weeks. *** Update pm Wednesday. On twitter, @RoyalMailstamps have said that the stamps will be on sale from Friday, which is 31st August - seeking clarification!! Corrected: images available Friday, in branches from Saturday 1st September. Hi Ian, Thanks for the latest update. I would like to know what Royal Mail intends doing with the Olympic and Paralympic Gold Medal Winners stamps in their annual De Luxe stamp album supplement pages for 2012 before investing in other display options. Will they be including them on miniature sheet pages or do they intend to just have a space for a single stamp for each design? Let us know when you get an answer from them. A key question for me is whether Royal Mail will be offering a discount on the new album for anyone who paid for the ill thought out (and much criticised) Gold Medal Winners Compendium? Just noticed the Royal Mail have updated their Gold Medal Winners page. It appears the size of the miniature sheet is smaller than expected and will be exactly like the Team GB ones except with only 2 stamps. The postmark for the FDC looks the same too. Any ideas why? "Each A4 sheet will feature 8 minisheets; 2 each of 4 Gold Medal Winners. Price £9.60." If there are 8 sheets to an A4 sheet instead of 4 as with the Olympics, they must be half the size? I was only saying that on your website, the size you put was the same as the olympic ones, but it is actually a lot smaller, but I can see your point and I was clearly not paying attention to that part of the writing. Thanks for that. Couldn't find it by searching their site! The situation regarding these stamps, and a lot of things at the moment, is very fluid and changes almost daily. As a result it is more than likely that the information shown on one blogpost may differ from another post, and from the website itself! I appreciate that this can be confusing and I apologise for the differences and errors. As you will appreciate from this post and some of the others, much of the information comes from Royal Mail, but much of it also comes from collectors and dealers, and maybe from some people inside Royal Mail or Post Office Ltd - anonymous comments are just that. The more you look at it, the more it seems that the original proposal was unlikely to produce a good result! Thanks for that. I look forward to seeing if the first gold medal winner sticks to today's design! And in addition, it looks like the more the Royal Mail change their website, the less they're publicing themselves! Any ideas what this discount is yet not holding my breath on a letter anytime soon my gold stamp sheets would be good too! Details still awaited on discount. Did you order gold medal stamps from us? If not, RM should have written to you by now, others have reported that they have had letter from RM with details of cost for you to agree. Hi all, as we sit ready waiting for the Paralympic opening ceremony, sherry in hand! A thought regarding 'completist' collectors has just occurred. It sounds like there will be a pair of mini sheets per strip on the A4 sheet. So does this mean that there will be a combination of selvage left and selvage right variations on each strip? As I sit, still cutting up Olympic GM miniature sheets into singles, listening to Rigor Mortis on Radio 4 extra, the answer is no. Question: On the Royal Mail shop site, it says there is a Team GB album to keep MS's and FDC's in but I don't know if it includes the Paralympic ones. Is there going to be a seperate album? I'm really confused! You today released that changes have been made and I don't know if this will mean anything to my subscription of FDCs! 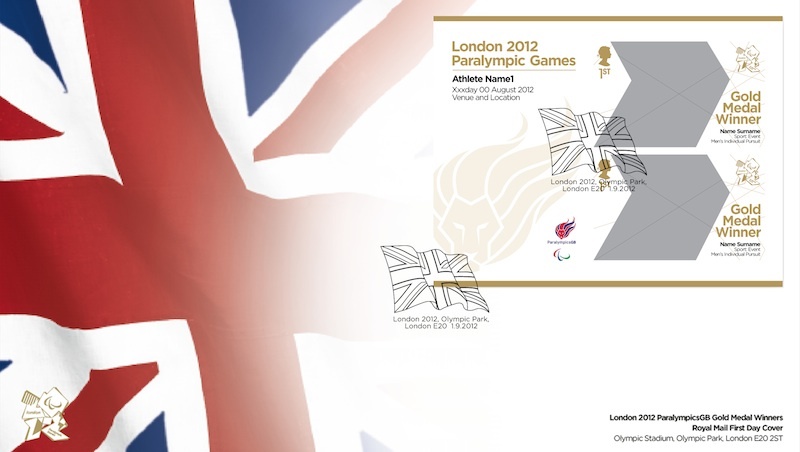 Question - will we be able to submit covers up to 28th September like the real olympics stamps? Yes, I believe the date is 8 October if you don't put them over the PO counter.